“Competition is good for business” – this free market maxim is almost always true, since healthy competition stimulates continual product improvements regarding quality as well as cost-effectiveness. 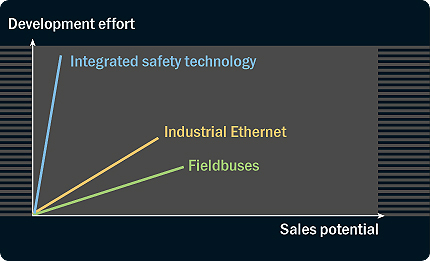 However, safety-oriented software and hardware development is a special case where this rule may not apply, because manufacturers in a market economy are faced with a high investment risk: there are considerable development costs, but there is only comparatively small sales potential. Hence, the automation sector has long been calling for a universal safety protocol, i.e. one that would give all manufacturers a solid economic base for all further development of safety-oriented products. The introduction of openSAFETY marks the first time a standard of this kind has become available that can be used license free by anyone. These graphs visualize how investment risk increases as development becomes more and more complex.